Doing right by the people of Las Vegas? By my count, the Mets have acquired eight players this offseason. It’s an odd lot: pitchers Greg Burke, Wanel Mesa, Scott Rice and Carlos Torres, infielders Brandon Hicks and Brian Bixler, catcher Anthony Recker and outfielder Jamie Hoffman. If you squint, you can envision the ways most of them might help the Mets at the fringes of their 2013 roster. Burke is a reliever who had a lot of success in Triple-A in 2012. Rice throws left-handed. Torres has a history of decent strikeout rates. Bixler can play practically every position. Recker is a righty-hitting catcher who has hit some in the Minors. Hoffman and Hicks have shown power from the right side at different Minor League stops. 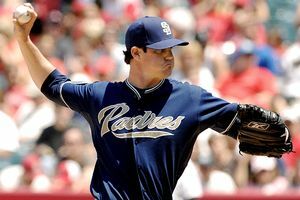 The odd signing — on paper at least — is Mesa’s, as the 25-year-old righty has not pitched in affiliated ball since 2010 and has never had any success above Rookie ball. He has struck out more than a batter an inning everywhere he’s gone, so — though I can find precious little information about him online — I’m assuming he throws gas and the Mets figured it worth taking a flyer on him and trying to adjust his mechanics. The other mildly (or not at all) interesting thing about the signings is that every guy besides Mesa has recent experience in the Pacific Coast League, home to the Mets’ new Triple-A affiliate in Las Vegas. Bixler, Hicks, Recker, Rice and Torres all spent some time in the PCL in 2012, and Burke and Hoffman both played there from 2009-2011. That could easily be a coincidence: Most of these guys, after all, have been bouncing around Triple-A for a few years, and half the Triple-A teams play in the Pacific Coast League. Or they could all have come to the organization on the recommendation of one particularly adamant West Coast scout. Or it could be that Sandy Alderson and the SABRos feel there’s some value in bringing in guys who understand the particulars of PCL play — the light air, the hard ground, the massive offensive output — to a Triple-A club set to feature some prized prospects with only International League experience on their resumes. Just something I noticed, is all.